Rugged and durable, all-terrain scooters are designed with outdoor exploring in mind. Their larger wheels and higher ground clearance allow for clear and stable passage over uneven or graveled surfaces. Many all-terrain scooters have front and rear wheel suspension which delivers a smooth and comfortable ride. 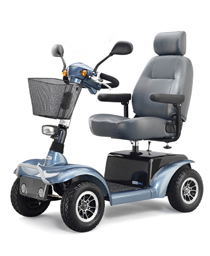 All-terrain scooters generally offer higher speed, dual rearview mirrors, headlamps, directional signals, and brake lights. Because these scooters are quite large, they are nearly impossible to use inside the home. All-terrain scooters do not disassemble for transport. Some models will fit on a vehicle lift. Storing these scooters near where they will be used is the best option. Although illegal for street use, they are great for sidewalks or trails, industrial complexes, school campuses, and rural areas. Want to expand your outdoor range to "off-road"
You need up to 7" of ground clearance. The pavement stops, but you can keep going.